Anyone who has been to Fetish Con has seen or knows Bernie BondageBunny. He is without a doubt one of our most memorable attendees and one of our most beloved as well. Everyone who sees him ends up smiling and he is always there to have fun with the crowd. Over the years we have talked about making Bernie our Official Furry Mascot now we want to make it official! 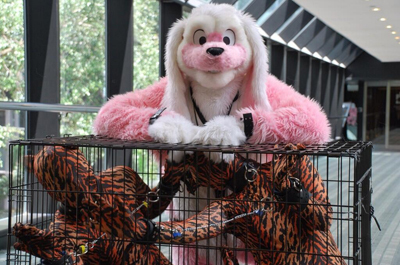 So please say hello and welcome our Official Fetish Con Furry Mascot – Bernie BondageBunny! Do you have pictures with Bernie BondageBunny from Fetish Con? If so, we’d love to share them here, please send them to: staff@fetishcon.com!